HUNDREDS of people in China’s southern Guangdong (廣東) province protested against the expansion of a coal-fired power plant on Sunday, state media reported, the latest sign of public discontent over pollution. Residents had complained of smog in Heyuan city (河源市) since the power plant there began operations in 2008, and officials recently approved a second phase for the project, the official Xinhua News Agency (新華社) reported. “There has been a strong police presence, though no reports of violence since the protest began at around 10am,” Xinhua said. Residents had collected more than 10,000 signatures in March on a petition opposing the plant’s expansion, it added. 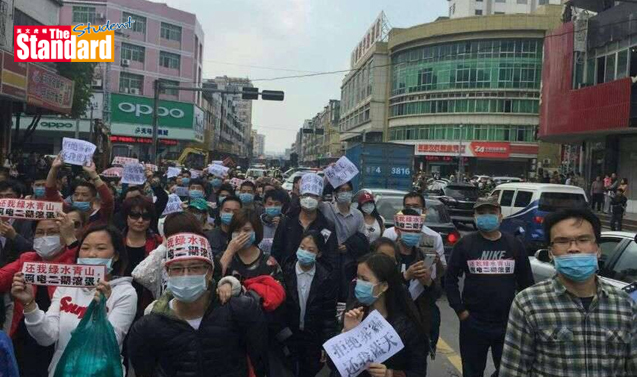 Xinhua did not give other details about the incident, but photos circulating on Chinese social media, which could not be verified by Reuters, showed hundreds of people marching in the street, some holding banners denouncing the project as damaging to health and blue skies. Xinhua said thousands had taken to the streets, but a man at the Heyuan government’s publicity office said only about 200 people had joined the protest. “There was no conflict. We are having a meeting right now to study the issue. City government leaders have gone to see protesters and communicate with them,” the man said, declining to give his name. Aware of the anger over environmental problems, the Chinese government has declared a war on pollution, vowing to abandon a decades-old growth-at-all-costs economic model that has spoiled much of the country’s water, skies and soil. China is trying to greatly reduce the country’s reliance on coal-burning and has also threatened to close thousands of industrial enterprises if they fail to comply with stricter emissions and energy use standards. Still, choking smog blankets many Chinese cities and the environmental degradation resulting from the country’s breakneck economic growth has angered its increasingly well-educated and affluent population. According to official data, only eight of the 74 cities monitored by the Ministry of Environmental Protection (環境保護部 ) last year met state air quality standards. The government does not expect average pollution levels to make the grade until 2030.